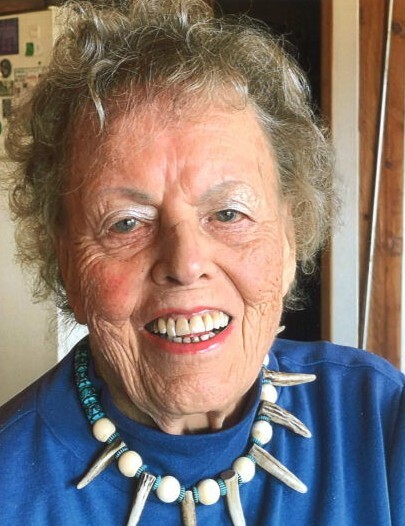 Annelise Domhoff-Borbe passed away March 24th, 2019 in Thermopolis, Wyoming. She was born on January 3rd, 1938 to Dr. Reinhold and Maria-Luisa Borbe in Heinrichswalde, East Prussia (Germany). Her early years were wonderful for a small girl until World War II broke out. As a young teen, she and her mother and sister had to flee with 25 pounds on their backs, never to see their homeland or father again. Her father was sent to the Russian front after refusing to join the Nazi party. Annelise became ill at a train station while fleeing the Russians, and was left behind for the duration of the war. At the age of 18, the Nazi’s forced her to work on a farm to produce food for the military. After the war she set out on her own to find her family near the Czech border. She had many stories of starvation and bleeding feet while walking all the way, but was able to find her mother and sister. Later, Annelise took an apprenticeship at Rudi Stahl pottery in Westerwald. There she achieved the rank of master potter after 3 years as a journeyman and 5 years of study at the Ceramic Academy in Hohr-Grenzhausen. She opened her first studio in the rear of a monastery, trading pottery for studio space. It was here that she met her future husband, Alfred “Fred” Domhoff when he came to buy a pot for his mother. The problem was, he had to get past Annelise’s police trained German Shepherd, which he allegedly bribed with sausage. Fred later convinced Annelise to go to British Columbia, Canada to start a new life as man and wife. They were married in Medicine Hat, Alberta, Canada before settling in Vancouver, British Columbia. There they had two sons, Stephan and Olaf. At Fred’s urging, they later moved to the United States and became citizens. Fred’s job had them moving frequently, and Annelise found colleges wherever they transferred, where she could continur her post graduate work in pottery. Eventually settling in Rock Springs, WY she started the pottery program at Western Wyoming Community College. She taught for eight years before retiring to Thermopolis, Wyoming where she started her own studio – Domhoff Pottery. Later her son, Stephan, joined her and they had a successful pottery business for 30 years. Annelise retired after 70 years as a master potter, and soon after, the pottery business closed so that Stephen could care for her as her health declined. There are too many awards, television spots, books and accolades to mention, but the one she was most proud of was being appointed to the Governor’s Commission for Women by Governor Mike Sullivan. He also commissioned her to make awards for volunteers. He liked her work so much he made her the potter to the governor, making special hanging plates for gifts for foreign dignitaries. Annelise will be missed by many friends and colleagues throughout the world, but mostly by her family. Cremation has taken place. Private funeral services will take place this summer.